Turkey's state of emergency is set to be extended for an additional 3 months, Deputy Prime Minister and Government Spokesperson Bekir Bozdağ said Monday. Speaking to reporters following a cabinet meeting, Bozdağ said the government will ask Parliament to again extend the state of emergency, which was due to expire Jan. 19, marking the sixth extension. Parliament has to approve the extension with a simple majority. Erdogan's ruling Justice and Development Party (AKP) dominates the legislative house. The extension has to be approved by the Parliament with a simple majority, where the ruling AK Party holds 316 of 550 seats. 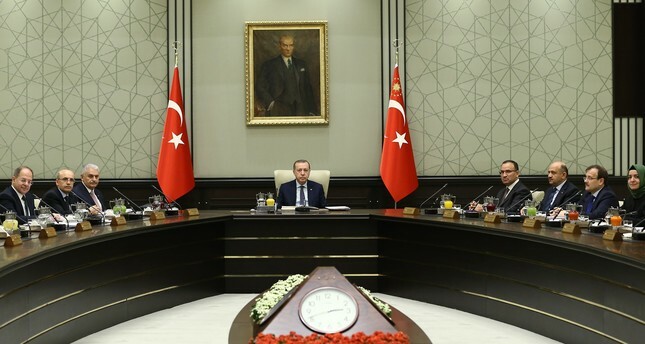 Turkey declared a state of emergency for the first time on July 20, 2016, following a deadly coup attempt by the Gülenist Terror Group (FETÖ), which martyred 250 people and left 2,200 injured. In the year-and-a-half since, security forces have arrested thousands suspected of involvement in the coup bid -- many through positions in the government and military -- and thought to pose a continuing threat. Bozdağ also welcomed opposition Monday's announcement by the opposition Nationalist Movement Party (MHP) that it would support President Recep Tayyip Erdoğan for reelection in 2019, rather than fielding its own candidate. Turning to foreign policy, Bozdag reiterated Ankara's request that Athens extradite to Turkey eight ex-soldiers who fled to Greece the day after the defeated coup. A Greek court on Monday suspended a grant of asylum given to one of the ex-soldiers, saying it will make a final decision on the fugitive on Feb. 15. Last January, the Greek Supreme Court ruled against extraditing the former soldiers -- a move Turkey called "politically motivated". Turkey has repeatedly called for extradition of the suspected coup-plotters, including during President Erdoğan's official visit to Greece last month. The coup plotter soldiers had arrived in Alexandroupolis (Dedeağac) city of Thrace region in Greece, aboard a stolen military helicopter hours after the defeated coup in July 15, 2016. FETÖ and its U.S.-based leader Fetullah Gülen orchestrated the defeated coup which left 250 people martyred and nearly 2,200 injured.